The service has been 'taking out the trash' since 2014. We use our phones to do everything from delivering our favorite late night cravings to tracking our exercise. So why can't we use the technology we engage with on a regular basis to do something good for the planet? Former Bank of America senior vice president Gregory Lettieri and his friend Adam Pasquale, whose great grandfather started in the garbage industry in New York City in the early 1900s, wondered the same thing. The two started Recycle Track Systems, dubbed the 'Uber for trash,' in 2014. The New York-based waste and recycling management technology company have quietly been picking up traction. RTS has raised $11.7 million in Series A funding from the Boston-based growth equity firm Volition Capital and signed up more than 500 customers including organizations Whole Foods, Soul Cycle, WeWork, and others that have signed multi-year contracts. So what exactly is RTS and how does it work? 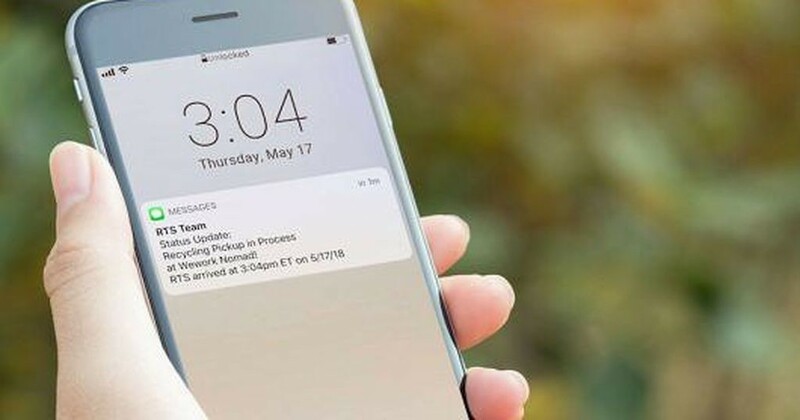 Similar to the way we use ride sharing apps, it gives users the ability to schedule on-demand pick-ups for larger items like furniture, along with offering regularly scheduled pickups as well for trash, recycling, and compost. When you schedule a pick-up, RTS hauls away unwanted items from your business or job site within 24 hours. Though other modern garbage companies like Rubicon have a similar business model, RTS said in an interview with Forbes that they use a different technology that lets them have a more personal experience with their customer by being able to text and email them with updates. "We’re truly like Uber or Lyft. A WeWork can use our app and tell us to come pick up three broken chairs and two printers," Lettieri told Forbes. "We like to say we provide white glove service. We take diversion rates to a higher level. We help you throw out more and recycle more. Our staffers, who we call sustainability analysts, train you how to sort your trash." RTS doesn't use their own trucks. Instead, they partner with local sanitation companies and install their technology in their vehicles. "There are 18,000 mid-tier independent hauling companies in the U.S., and what [we’re telling them is that] we have the technology; we can get these clients," Lettieri told Tech Crunch. "We’re using tech to fill out these routes that already exist. These trucks are traveling seven days a week anyway, but we’re providing them access to business that they didn’t have before. We’re bringing together these independent operators to create our own virtual fleet." RTS is making an impact on the $65 billion garbage industry and it's not slowing down. It now offers its services to schools, hotels, restaurants, stadiums, and supermarkets in cities including New York, Washington D.C., Philadelphia, Baltimore, and Chicago. They're proving even in a traditional market like waste management, there's always ways to reinvent systems to make them more modern, effective, and eco-friendly for consumers. "We’re built for the 15,000 independent waste hauling companies to use," Lettieri told Forbes. "We’re changing an industry."